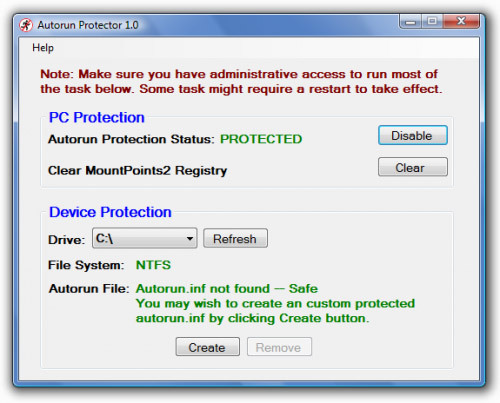 Autorun Protector is a freeware application that provide your PC two-way protection to prevent infections of autorun worm and also protecting your removable device from being infected from other sources. 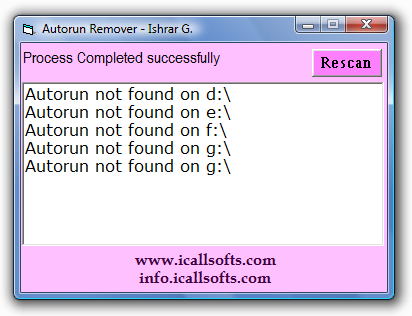 Autorun Protector does not help you to clean all type of autorun worms. It is to protect your PC & Device from infecting the worms. The free Panda USB Vaccine allows users to vaccinate their PCs in order to disable AutoRun completely so that no program from any USB/CD/DVD drive (regardless of whether they have been previously vaccinated or not) can auto-execute. This is a really helpful feature as there is no user-friendly and easy way of completely disabling AutoRun on a Windows PC. 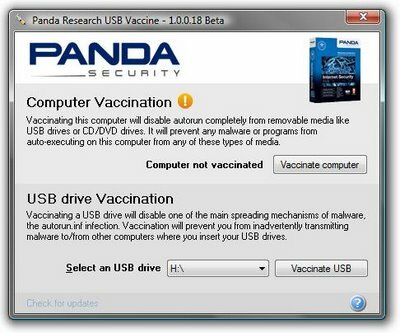 The free Panda USB Vaccine can be used on individual USB drives to disable its AUTORUN.INF file in order to prevent malware infections from spreading automatically. When applied on a USB drive, the vaccine permanently blocks an innocuous AUTORUN.INF file, preventing it from being read, created, deleted or modified. USB FireWall is an application which protects you from all malicious programs which try to launch itself as soon as a USB device is inserted. It will inform you if ever a such program exists in your USB peripherals. This application runs in background task and alerts you immediately in case of try of intrusion. 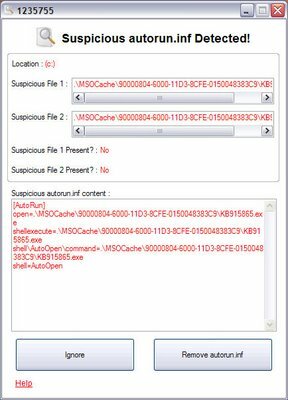 You can remove the malicious file and the file autorun.inf associated with just one click. Autorun Eater is not an anti-virus, it works side-by-side with your anti-virus application. As more and more malware resort to autorun.inf file tactics, there has been a need for such a tool, especially for new users. Autorun Eater warns you when a suspicious autorun.inf worm is detected on your storage device. iKill scans the drives for the presence of removable drives. If found, it parse the autorun.inf file for the executables it may run. If AutoProtect is enabled, it will automatically delete the files present on the drive otherwise, you will be asked if you want the suspected files deleted. Ninja is a freeware application designed for guarding computers against viruses transmitted by USB pendisks. Ninja awaits quietly in the system tray for the times whenever a USB pendisk is inserted on the computer which will be examined to uncover the commonly malicious or virulent files known as “autorun.inf” and “ctfmon.exe” amongst many others. The Autorun.inf-file is unsafe, but turning it off is uncomfortable and does not protect other computers. This program does. And it also performs certain actions when a USB-Stick is plugged in, so you won’t lose functionality. It checks the Autorun files in your all drives and ask you to delete it if it appears dangerous for you computer. USB Protect is a freeware application which protects your PC from autorun.inf virus spreading from pen drives. USB Protect runs in background and remove the autorun.inf files found on pen drives. Great collection, Every time i put my pendrive in college PC autorun files are my risk concern ! ChetanÂ´s last blog post..Download a Free Image resizer – a small software by Microsoft. Thanks for the suggestions and information’s. Autorun.inf files sometime doesn’t track by the anti virus(specially when you don’t have the licensed copy of anti-virus). Exceptional webpage. My class mates and I were just discussing this the other night. Also your webpage looks great on my old laptop. Now thats uncommon. Nice work.